Emotions are obviously a very important part of playing games, when you can't express your mind as freely as in real life. We all use some form of expressing our emotions when chatting with friends, whether with emoticons or other things.They help with expressing ourselves, but they're can also be important part of communication, especially in online multiplayer games like DotA or LoD! 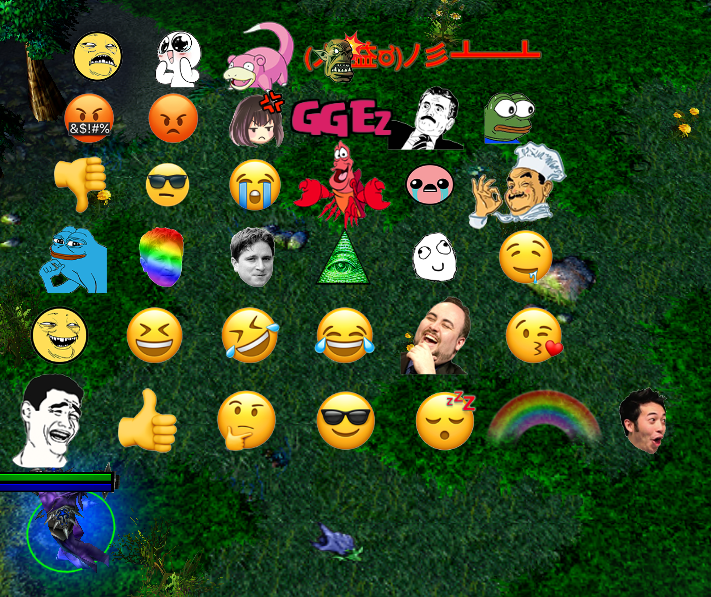 We're glad to present Emoticons to the DotA world, where emotions get so intense, that they cannot be handled with just letters. Emoticons may be used to compliment teammates, to trigger your enemies or to troll them, and for many other uses you'll surely think of. Also make sure to check Frequently Asked Questions if you haven't yet. Donate 5$ or more for emoticons. They're available for anyone who supports DotA Allstars development by donating. Using them is simple: type in proper alias in chat (ally, all-chat - doesn't matter), and the emoticon will appear above your hero. It works even if your hero is dead - emoticons will spawn above your death location. Remember that they are visible even if enemies can't see your hero due to invisbility. Check below to see all messages that trigger emoticons. You can use it as many times as you want, but each use has a 3.5 second cooldown. As any other bonus, emoticons are bound to nickname and work in single player as well as local games.